How Dedication And Commitment Can Help You Achieve Your Goals! Have you had an injury and struggled to get back to the gym? Read Ric Drasin's story about how dedication to his ideal physique has kept him fired up for more than 40 years! Dedication in training can have a positive effect on everything you tackle in life if you apply the same focus and energy you do in training. I always felt that if I would have one dollar for every hour I spent training hard over the past 45 years, I'd be a millionaire today. In the early 1960's I began working out at the local YMCA in a small town. You might say I was odd, weird or eccentric as my friends thought, but in reality, I was way ahead of my time. I knew then at 16 I wanted to develop my body and nothing was going to stand in my way. I was playing lead guitar in a very popular rock band and was good enough to be offered a recording contract with Capital Records. I dedicated myself to being the best at the time and it paid off. But, I wasn't satisfied with that as it just wasn't enough for me and I was hungry for more. I wanted to look my best and at 150 pounds that wasn't the look I wanted. It was normal to others, but I didn't want to be normal. I began reading some of the muscle magazines, copying diets, routines and applying them to my workouts at the gym. The YMCA back then was a maze of bent bars, broken weights strewn all over the floor, one cable machine that had wires on the cable sticking out plus a calf machine that would swing weights and bruise my shins. Not only that but there were young kids running all around in and out of the place which was really distracting. Through all that, I kept my focus and I was extremely dedicated to the sport of bodybuilding. My body weight started rising to 175, then 190 and again to 205 whereas I actually broke the 200-pound barrier. I was excited and inspired to go farther. My school friends around me would snicker and tell me that one day all that muscle would turn to fat. That was the conception back then even with adults. No one had the knowledge that muscle and fat are two different things. I just laughed it off and trained even harder. I'd Get My Training Done First And Then I'd Go Out. When You Put Something First Like This, You Can't Help But Succeed. I hit the gym every day after school without fail when other friends were out having fun. Many times I worked out late on Friday nights and passed on the local clubs and parties, as this was more important. I'd get my training done first and then I'd go out. When you put something first like this, you can't help but succeed. There wasn't a lot of knowledge about diet back then and the basics were meat and milk. I had a powerlifting background from the start so this diet gave me a lot of strength. I even added powdered milk to my regular milk to add more protein as there wasn't any good protein powder available. I also added dehydrated fish powder with water that tasted like vomit but it was the purest source of protein. I would go to any extreme to make gains. I might add that there were no anabolics back then so the gains I made, stayed with me. I developed myself so well that by the time I was 20, I was asked by some Pro Wrestlers to come join their world of Professional Wrestling. I had an interest in it since my childhood and at that point had won a few bodybuilding contests. The trophies were dust collectors and I wanted my body to make money, not just awards. If my friends felt I was eccentric before, then this would really drive them over the edge; they were conditioned to have the 8-to-5 job and be happy with that. That was something that was just not in the cards for me. Learning to be dedicated in one field would just apply somewhere else in life, so I took the challenge and started training with the Women's Wrestling Champion at the time, Mae Young, upstairs in the famous Grand Olympic Auditorium. Learning To Be Dedicated In One Field Would Just Apply Somewhere Else In Life, So I Took The Challenge And Started Training. I trained 5 days per week, driving 120 miles each way from home. I trained 2 hours in the ring, suffering sprains, broken nose, pulled groin and masses of bruises and mat burns on me. I'd drive home and go right to the gym and train with weights for another 2 hours. Sure, I was tired, sore and beat, but I had to get my workout in. Having a good body is what got me noticed and I couldn't let that slack. Not only did I do all that but I also worked at the gym, and played guitar in the band on weekends at all the school dances. If you ask about social life, yes, I did manage to fit a girlfriend in there as well. This is what dedication is about. You just have to divide your time and make each thing work for you. The training for wrestling brought on a lot of different injuries than bodybuilding and more severe being that I had to learn various styles, American, Mexican, and Japanese and Shoot wrestling for actual submissions which is not taught today except by me. I increased my protein by adding more eggs and cottage cheese along with the meat and added more calories with rice and oatmeal. If I hadn't done that, I would most likely have been back down to the 150 pounds that I started with. In time, I adjusted to both training sessions but some of the people who started wrestling at the same time I did, dropped out and went back to their day jobs. I believe that I was the only one at that time who followed through and started wrestling on TV within the first six months. 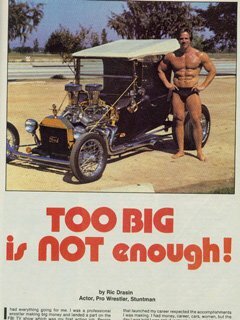 Over the years of training and moving to Venice Gold's in 1969 increased my knowledge of training methods by hanging out with Arnold and Joe Weider and also varied training programs that were basic but worked. The key to it all was commitment and dedication. Ric Drasin, Gary Johnston, and Dave Shambeau. Muscle Beach 1971. I wrestled up to the age of 60 with numerous injuries but rarely, if ever, missing a work out. I even trained after tearing off both quads and then amputating 3 fingers didn't keep me out of the gym any more than 36 hours. I worked around the injuries and found various things I could do that worked. Now at 65, going to the gym every morning in pain all over is not easy and without dedication it wouldn't happen but the alternative is to sit and be a vegetable. I see people in the gym who wimp out at a broken finger nail or a sniffle. Some have trainers and both the trainer and client are talking on their cell phones while training. Many complain to me about minor aches and pains and then have the nerve to ask me why I limp. I should carry my injury chart to show them and maybe they'd quit asking. They have no idea the dedication it takes and that's why many never change in appearance. If you don't use it, you will surely lose it. If I can train through all this for all these years of getting bounced around in the ring, then there is no excuse you can throw at me. Be strong, commit, and dedicate yourself to be the best YOU that YOU can be.